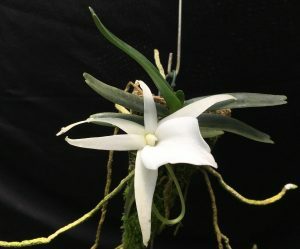 The name elephantinum means gigantic angraecum but it is actually one our smallest Angraecum species. This plant is flowering for the second time six years out of flask and is just 6cm high and 8cm across. Of course it is the flower that is gigantic compared to the plant and it pretty much hides the whole plant. The species comes from the mountains of Madagascar and the plant can be grown quite cool – we are growing it here at a minimum of 10C. This plant was one of the BOC babies given away in vitro at our last British Orchid Congress in October 2012 – this was one of the left over small ones – but well worth growing on. We mounted it on cork straight from the flask and it grows wet and bright so sprayed daily and near the top of a cool greenhouse. We will next host the British Orchid Congress on November 2018 – 2nd to 4th – see you there  (check out our British Orchid Show tab for more details) I wonder what the free species in-vitro will be this year?